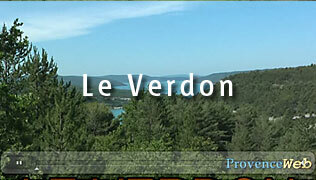 Departement of the Alpes de Haute Provence - Verdon - Pop. : 120 inh. - Altitude : 900m. 12 km. north of Castellane. 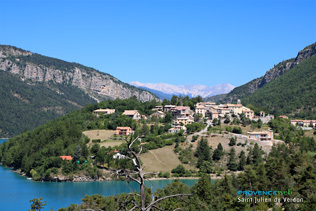 Saint Julien du Verdon is situated on the sunny southern side of a hill in a mountain cirque wooded with pine and oak. 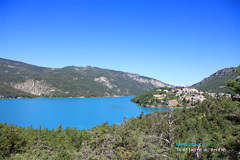 There is a wide view of the calm clear waters of the Castillon lake. 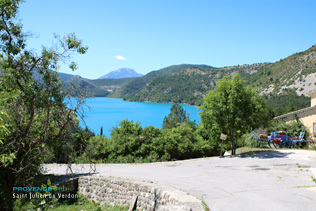 At 900 m. altitude and with a mild Mediterranean climate, the air here is pure and envigorating. Many day outings are available in the region either on the Côte d'Azur or for skiing at the Col d'Allos. 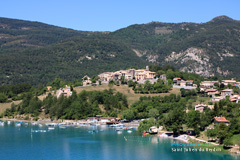 The Verdon gorges and the Castillon lake are nearby and offer every kind of water entertainment. There are pleasant hiking trails set up by theme on which you can learn about the geological treasures of St. Julien. 17th c. Notre Dame Chapel. Water sports on Castillon lake. White water sports in the Verdon gorges. 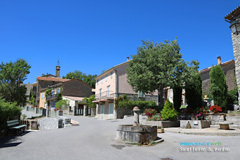 Vergons (6km), Saint André les Alpes (8km), Demandolx (10km).